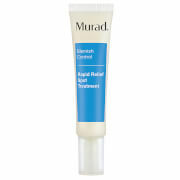 Murad Rapid Relief Spot Treatment 15ml, a clear and fast-acting facial treatment gel for occasional spots and breakouts. The fast-acting invisible gel penetrates into the skin and deep into pores to reduce blemish size and redness within 4 hours. The gel uses Salicylic Acid to exfoliate and soothe skin, a patented treatment complex, inspired by Thyme and Pine, to fight irritant and Horse Chestnut with Oat Extracts to soothe skin and reduce redness. Active Ingredients: Salicylic Acid, Horse Chestnut Seed Extract, Oat Kernel Extract. Skin Type: All Skin Types, Blemished Skin. Fast-Acting Clear Blemish Treatment Gel. 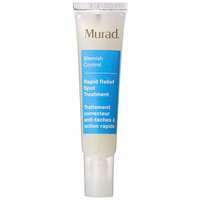 Murad Rapid Relief Spot Treatment 15ml was found on 4 websites and was price compared using EAN: 0767332807980. The cheapest Murad Rapid Relief Spot Treatment 15ml is shown as the main item, prices range from £17.00 to £20.00, excluding delivery. Price comparison based on price and delivery charges, with any valid discount codes being applied, is shown in the table above. Prices and information correct at the time of publication.